At the moment I am reading up on evidence for climatic variability during the past 5,000 years or so as part of my PhD dissertation. There is a fairly substantial and specialised body of literature in this area in journals such as Quaternary Science Review, The Holocene, Quaternary International and so on. Research in this area proceeds at a very swift pace with numerous new publications being produced each year that can have important implications for models of past environments in specific regions or at a global level. As a non-specialist it can be a little difficult to access this body of knowledge without first consulting an authoritative overview of many other more specialised (and often arduously complex!) sources. There are several publications that I thought I would quickly highlight here today which may be of relevence to anyone interested in writing or learning about Holocene climate change. The first is a book published in 2001 by Cambridge University Press for the Intergovernmental Panel on Climate Change (IPCC) entitled ‘Climate change 2001: the scientific basis’ and edited by Houghton et al (1). This report was developed as a contribution to the IPCC Third Assessment Report and is intended to provide “…the most comprehensive and up-to-date scientific assessment of past, present and future climate change” and to “…form the standard scientific reference for all those concerned with climate change and its consequences” (2). The book principally focusses upon analysing and assessing evidence for recent climate change and in particular those changes bought on by increasing concentrations of atmospheric greenhouse gases however as part of this it reviews evidence for past environmental change, particularly in the past few thousand years. It is written in a very accessible style and provides clear explanations of key concepts and terms that appear regularly in more specialised publications (such as ‘climate forcing’, ‘proxy indicators’). Chapters 1 and 2 are probably of most relevance to people interested in understanding past climatic systems. Almost a decade has passed since it was published and thus new data are available from more specialised sources, however this book nevertheless provides a readily accessible starting point for anyone interested in understanding past climates. A second comprehensive technical paper of note has recently been published in Quaternary Science Reviews by Wanner et al 2008 entitled ‘Mid- to Late Holocene climate change: an overview’. As it is written for a specialised audience this particular article may not be for everyone however it provides a comprehensive review of proxy-based climatic reconstructions which apply to the past 6,000 years. It is global in coverage and aims to develop an explanatory framework for climate change and variability during the past 6000 years or so. Unfortunately, it is not freely available and you will need institutional or library access of some type, or you can purchase it online at the link below. You can download the citation directly into a bibliographic database from my citulike webpage. The abstract is available online at the Elsevier website. * Note: Figure 1 is a Creative Commons licenced image created for Global Warming Art, originally prepared by Robert A. Rhode. It is not drawn from either of the sources I have discussed in this post. 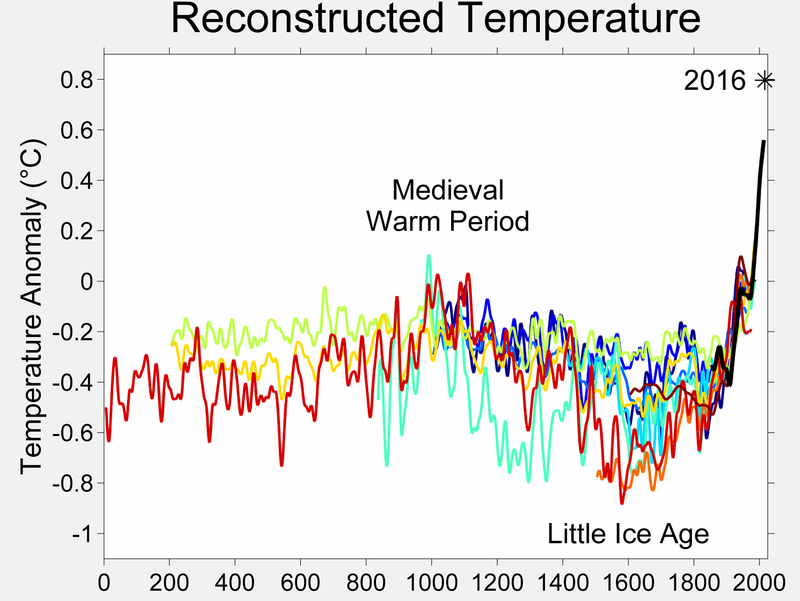 It represents a comparison of 10 different published reconstructions of mean temperature changes over the past 2000 years and is simply included here to highlight the extent of recent (past 2000 years) climate change.